Title: IS THAT IBRU ON THE LINE? After contacting Johnny & Andy, they were kind enough to pass on the email addresses for Dr. Pius and Barrister Ibru. I wanted to see if I could get some phone action out of them too! My apologies to the late reply to you email but in fact I have been working away overseas for the last 3 months on a project to install a telephone system in a small village just outside central Singapore. Unfortunately I no longer have a copy of the original email that you sent to me, but I believe you wanted help to transfer some funds from your country into my account? I am sure that I may be able to help you in this matter as I am always looking for new business opportunities, so please, if you still need my help I would like you to explain the details of your proposal. My apologies again for the lateness of my reply. I HAVE RECEIVED YOUR E-MAIL THIS MORNING, I MUST CONFESS TO YOU, I AM VERY SURPRISED TO HEAR FROM YOU, AFTER MY LONG TIME MAIL TO YOU. ALL THE SAME, I HAVE ACCEPTED YOUR APOLOGIE SINCE YOU ARE AWAY FOR A BUSINESS TRIP. AGAIN I WISH TO SAY A BIG THANKS TO YOU FOR YOUR CONCERN AND RESPOND TO THIS BUSINESS TRANSACTION. I HAVE CONFIRMED YOU SERIOUSNESS AND SINCERE INTEREST ON THE DEAL WE PROPOSED. I SURE KNOW THAT THIS IS A LIFE TIME OPPORTUNITY AND NO ONE WOULD LIKE TO MISS IT. THE REALITY OF THE TRANSACTION IS ASSURED, THERE IS NO DOUBT ABOUT IT, BUT THE ONLY THING I WILL SAY IS SEEING IS BELIEVING ALSO ENGLISH SAYS THAT ACTION SPEAKS LOUDER THAN VOICE. THE MONEY IN QUESTION WAS AN OVER INVOICED CONTRACT SUM AWARDED BY A FOREIGN CONTRACTOR, THE CONTRACTORS DULY PAID THEIR CONTRACT SUM, SO WE ARE LEFT WITH THE OVER INVOICED CONTRACT PAYMENT OF (US$30M) WAITING FOR CLAIM OF IT, IN THE CENTRAL BANK OF NIGERIA (APEX BANK). I WAS THE PERSON THAT APPROVED/SIGNED THIS SAID CONTRACT TO THE CONTRACTORS, WHEN I WAS STILL IN THE OFFICE AS A SENATE PRESIDENT, SO I NOW USE THE CHANCE/POWER TO INFLATE THE CONTRACT SUM. WHY I AM OPENING MY SELF TO YOU, I WANT YOU TO UNDERSTAND THAT THIS IS A DEAL BETWEEN YOU AND I, EVERY LEGAL DOCUMENTS BACKING THESE MONEY UP, WILL BE OBTAINED BY THE LAWYER. SO I WANT YOU BE REST ASSURED THAT EVERYTHING WILL GO ACCORDINGLY. I ACTUALLY WANT TO PRESENT YOU/YOUR COMPANY TO THE CENTRAL BANK OF NIGERIA, WHERE THESE MONEY IS PRESENTLY AS A FOREIGN PARTNER, SO THAT THE MONEY WILL BE APPROVED TO YOU AND HAVE IT TRANSFERED INTO YOUR ACCOUNT IN YOUR COUNTRY, WITH MY POSITION AND CONTACT IN THE GOVERNMENT, I WILL CAREFULLY OBTAIN ALL THE NECESSARY DOCUMENTATION THAT WILL LEGALISE THIS BUSINESS FOR THE PAYMENT IN YOUR FAVOUR. THESE DOCUMENTS WILL LEGALISE THE TRANSACTION BEFORE THE FEDERAL GOVERNMENT AND OTHER RELEVANT DEPARTMENT INVOLVED, FOR SAFETY PROCESSING OF THE TRANSFER. MEANWHILE, THE TRANSACTION IS PROGRAMMED TO BE CONCLUDED WITHIN 14 WORKING DAYS STARTING FROM THE DAY I RECEIVE YOUR BANK ACCOUNT PARTICULARS, AS SOON AS I GET YOUR BANKING PARTICULARS, I WILL HIRE A LAWYER ON YOUR BEHALF, WHO WILL ASSIST IN OBTAINING ALL REVELANT DOCUMENTS BACKING THESE FUND UP IN YOUR FAVOUR, BEFORE PASSING IT TO THE BANK WHERE THESE FUND IS PRESENTLY, YOU KNOW I CAN NOT SHOW UP MY FACE IN THE BANK, SO THAT THEY DON'T START SUSPECTING ME, THE LAWYER WILL ASSIST US TO PRESENT EVERY DOCUMENTS BACKING THESE FUND UP TO THE PAYING BANK. I SHALL PROTECT BOTH PARTIES INTEREST, IN THIS CASE YOU HAVE NO CAUSE TO ENTERTAIN FEAR. REGARDING THE SECURITY OF THE DEAL, I AM ASSURING YOU THAT I HAVE FORTIFIED IT WITH 100% SECURITY IN SUCH A WAY THAT WE SHALL HAVE FREE AND FAIR TRANSFER OF THE MONEY INTO YOUR ACCOUNT. FINALLY, PLEASE FORWARD TO ME ALL THE INFORMATION STATED BELOW, WITH ALL THIS INFORMATION, I CAN WRITE A LETTER TO THE CENTRAL BANK OF NIGERIA, INSTRUCTING THEM TO TRANSFER THESE MONEY TO MY FOREIGN PARTNER (YOU). YOU HAVE TO BEAR IN MIND THAT THIS TRANSACTION REQUIRES HIGH LEVEL OF SECRECY AND CONFIDENTIALITY TO ENABLE US ACHIEVE OUR GOAL. REMEMBER AS THE SAYING GOES: "TOGETHERNESS, HONESTY AND UNDERSTANDING MAKES A GOOD TEAM". 3. FULL BANKING PARTICULARS, THIS IS VERY IMPORTANT TO INDICATE WHERE THE MONEY WILL BE TRANSFERRED INTO, INCLUDING THE SWIFT CODE IF ANY. 4. YOUR SELF IDENTIFICATION, TO ENABLE ME KNOW WHO I'M DEALING WITH. THANKS AND GOD BLESS YOU, PLEASE CALL ME AS SOON AS YOU RECEIVE THIS MAIL, FOR MORE CLARIFICATION. Thank you for your very prompt and professional reply, and also for your explanation of the detailed facts. I tried to call your number as requested but there was no reply. Please feel free to call me at you convenience. GOOD DAY TO YOU, I HAVE RECEIVED YOUR EMAIL WITH THE FULL INFORMATION OF YOUR BANK FOR THE TRANSFER OF THE MONEY TO YOUR ACCOUNT IN UNITED KINGDOM. HOW EVER, TOMORROW I WILL VISIT THE CHAMBER OF BARRISTER IBRU CHIJUKA, TO HAVE A BRIEF DISCUSSION WITH HIM, CONCERNING OUR BUSINESS TRANSACTION, I WILL NOT OPEN UP TO HIM CONCERNING OUR DEAL, I WILL ONLY TELL HIM TO STAND AS YOUR INTERNATIONAL LAWYER HERE. AS SOON AS I FINISH WITH HIM, I WILL IMMEDIATELY WRITE A LETTER OF INSTRUCTION TO THE BANK (CBN APEX BANK), ATTACHED WITH THE INFORMATIONS YOU PRESENTED TO ME, FOR HIM TO PROCEED TO THE BANK IMMEDIATELY. MORE SO, MR. STUART JOHN, YOU HAVE TO HAVE IT AT THE BACK OF YOUR MIND, YOU MUST NOT DISCLOSED THIS DEAL TO ANY OTHER PERSON, EVEN THE LAWYER, BECAUSE YOU WILL BE HAVING CONSTANT CONTACT WITH HIM. I WILL SEND YOU HIS CONTACT INFORMATIONS BY TOMORROW. FURTHER MORE, AS YOU MAY KNOW, THIS DEAL IS NOT AN OBJECT OF JOKE, AS WE ATTACHED MUCH IMPORTANT TO IT SINCE IT IS OUR LIFETIME OPPORTUNITY. IN THIS CASE, KINDLY MAINTAIN A HIGH LEVEL OF SECRECY ON THIS TRANSACTION BECAUSE THE SUCCESS OF THE DEAL DEPENDS ON HOW SECRECY WE KEEP IT, AND AS FOR MY SIDE I SHALL TAKE CARE OF THAT PROPERLY, YOU SHOULD AS WELL TRY TO SECURE YOUR SIDE. FINALLY MY GOOD FRIEND, PLEASE I WILL ADVISED WE HAVE A CODE IN THIS TRANSACTION, SO THAT YOU AND I WILL BE ON A SAVE SIDE IN THE TRANSACTION, WHEN EVER I SEND A MAIL TO YOU IF YOU DID NOT SEE MY CODE ON IT, PLEASE DO NOT REPLY TO THAT MAIL, OR I CALLED YOU ON THE PHONE, MAKE SURE YOU ASK ME FOR THE CODE, IF I DID NOT TELL YOU THE CODE, DO NOT ATTEND TO ME, THE CODE IS (CORRECTION). I WILL CALL YOU TOMORROW, TO LET YOU KNOW THE OUT COME OF MY DISCUSSION WITH THE LAWYER, ALSO I WILL FORWARD TO YOU MY SELF IDENTIFICATION TO ENABLE YOU KNOW WHO YOU ARE DEALING WITH. PLEASE EXPECT MY CALL TOMORROW. Believe me sir, if I thought this proposition was a joke I would never have replied to you. You can be assured of my utmost secrecy in this matter. As a businessman of many years I am well aware of the importance of secrecy with such transactions. I shall look forward to your call tomorrow. If possible, please inform me of the time the you will be calling (UK GMT) so that I can be sure I am home to receive your call. MY DEAR FRIEND, THIS IS THE LETTER I SENT TO YOU BEFORE YOU REPLIED ME BACK, IS VERY IMPORTANT YOU GO THROUGH IT AGAIN, SO THAT YOU KNOW THE MODE OF SHARING OF THESE MONEY. ALSO TO KNOW WHAT I WILL USE MY OWN SHARE OF THE MONEY FOR. I am Former Senator Anyim Pius Anyim,The Former Senate President of the Federal Republic of Nigeria, Though this proposal may be very surprise to you as we have not met in any way before. I got your contact address through your country business Guide and feel you will serve as a reliable source to be used to achieve this aim, by trusting under your care the total sum of Thirty million US dollars (US $30M). The Construction of the Stadium have been completed and commissioned the contractor have been paid, then this over invoiced amount (USD.30M) is what I want to trust under your care for lucrative investment of your choice in your country. As a former Senate President, l find it very difficult to invest such amount of money in my country due to my position in the Government such amount of money may attracts some suspicion which may lead to my arrest, that is why I need your urgent assistance, Please indicate your interest in the area of a lucrative business viability in your country. The proposal should be kept strictly confidential due to my person in the Government as the Former senatePresident of Nigeria. Please indicate your interest by providing me with your private direct phone line / fax number. And I assure you that all we be well at the end of this transaction. GOOD EVENING TO YOU, HOW ARE YOU AND YOUR FAMILY? SORRY THAT YOU HAVE NOT HEARD FROM ME SINCE MORNING, I WAS SO BUSY IN THE OFFICE WITH MY OFFICIAL DUTY. I HAVE SUCCEEDED IN HIRING THE LAWYER ON YOUR BEHALF, AFTER MY DISCUSSION WITH HIM, HE PROMISED VISITING THE BANK TODAY, TO PRESENT YOUR INFORMATION AND THE LETTER OF AUTHORITY FROM ME. HOW EVER, I HAVE ALREADY PAID HIM FOR THIS JOB, SO YOU DON'T NEED TO PAY HIM ANY MONEY. BUT, YOU MUST HAVE IT AT THE BACK OF YOUR MIND, WHAT EVER MONEY WE SPEND IN THIS TRANSACTION, WILL BE PAY BACK BEFORE SHARING THE MAIN MONEY/INVESTMENT. MORE SO, MY GOOD FRIEND, I HAVE PASSED ALL YOUR CONTACT INFORMATION TO THE LAWYER, AS SOON AS HE COME BACK FROM THE BANK, HE WILL UPDATE YOU IMMEDIATELY. AS I HAVE EARLIER TOLD YOU, YOU WILL BE DEALING WITH THE LAWYER DIRECT, I TOLD HIM THAT YOU ARE MY FOREIGN PARTNER, SO PLEASE DO NOT LET HIM KNOW ANYTHING CONCERNING OUR BUSINESS TRANSACTION, AS YOU KNOW THE NATURE OF THIS BUSINESS, AGAIN, PLEASE DO FOLLOW TO HIS INSTRUCTIONS, HE IS A VERY INTELLIGENT AND WELL KNOWN ATTORNEY IN THIS COUNTRY. FEEL FREE TO CONTACT HIM ANY TIME. Thank you for your email below and also for repeating the details of your first email. In fact your terms are perfectly acceptable to me. As soon as barrister Ibru contacts me I shall get back to you. Dr. Galadima Bello Adamu, after I submitted your information's and the letter of authorization from your partner to him, he made me to understand that before anything can be done, I have to provide the certificate of incorporation that made you and Dr. pius anyim a foreign partner, also a letter from the federal high court of justice (affidavit), indicating that your partner is authorizing them to transfer these fund to your account in united kingdom. 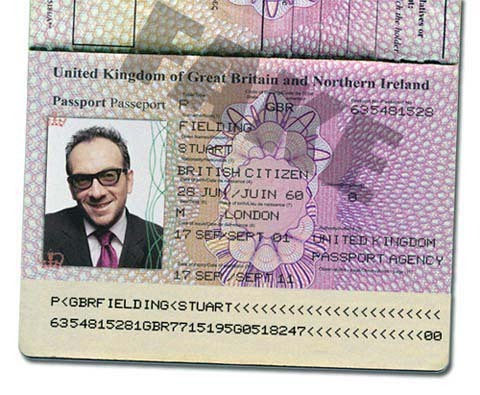 I will be used in registering the company by Monday, (STUART FIELDING & PIUS A. INTERNATIONAL LTD). Finally Sir, after my discussion with your partner, he instructed me to relate this to you, if you are okay with the name of the company, before I will proceed to Abuja for the registration. Sir, all this development will cost you and your partner US$11,300, my flight fare and my hotel accommodation will cost US$300.00, then the certificate it self is US$10,000, while the tipping/bribe to enable them quicken the job is US$1,000. Call me as soon as you receive this mail, for more information. Hello to you, how are you and you entire family? I tried to call you yesterday as promised; your phone was ringing no response. I have collected the sum of US$7,000 from your partner Dr. pius anyim, he told me that you have discussed with him after when I called you yesterday, that you will take care of the remaining balance, which is US$4,300. I have also tried to call you this morning, but to no avail. Mr. John, I will be leaving to Abuja tomorrow afternoon, around 12:30 pm, I will advise you quickly go and send the money through western union money transfer before the time, so that I can quickly go and cash it and fly immediately. 2.ADDRESS: 35, IDOLOWU STREET, SURULERE, LAGOS-NIGERIA. As soon as you make the payment, quickly forward me with the control number, so that I can quickly go and cash it and proceed immediately. Thank you for your telephone call the other day. My apologies for the late reply. Please note that the payment of $4,300 has now been made to you by Western Union Money transfer. 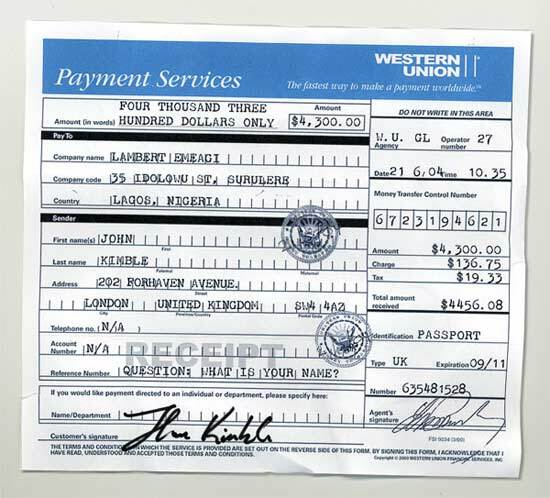 For you records I have attached a scan of my payment receipt. what is going on, i think i have to prosponed this journey till tomorrow. Furthermore, Mr. John, since you have made the payment, i will advised you go straight to the bank, ask tell them that the person you sent the money to, did not receive it. Thanks, i will be waiting to hear from you soon. Subject: FROM DR. PIUS ANYIM, WHAT IS HAPPENING? GOOD AFTERNOON TO YOU, HOW ARE YOU AND YOUR FAMILY? THIS AFTERNOON THE LAWYER CALLED ME ON THE PHONE TO LET ME KNOW THE PROBLEM AT HAND, MY FRIEND WHAT IS GOING ON? DID YOU SEND THE MONEY TO HIM? THE LAWYER SAID THE MONEY IS NOT IN BANK SYSTEM.WHY? PLEASE DO GO TO THE BANK AND MAKE ENQUIRY CONCERNING THIS MATTER. THE LAWYER HAS TOLD ME THAT HE WILL NOT BE TRAVELLING TODAY AGAIN, HE WILL BE LEAVING TOMORROW AS SOON AS HE GET THE MONEY. Hello to you, I am writing to let you know that I have tried to call you several times but to no avail, Mr. John, I want you to understand that you are not the only person I have as my foreign clients, I have so many things to do, if you know that you have not made these payment, why are you telling me that you have done it? Mr. John, I want you to know that today is the last day, if I did not leave to Abuja today for this mission, I think I have to stop everything. Before writing you this mail, I have discussed with your partner this morning, he made me to understand that if you don't have the money, is better you let him know, so that he can know what to do. Mr. John, let me ask you, why are you kidding? I am not the kind of person you will be kidding with ok, have you ask your partner about me? Try to ask him whom you are dealing with. Finally, if you know that you are still interested for me to proceed this mission, for your own good, you better go ahead and make a correction of the western union payment that you said you have done.